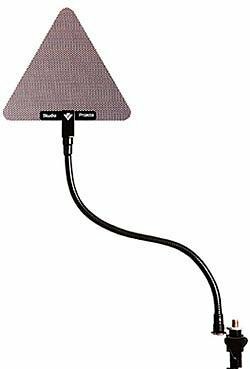 The Studio Projects SP-MPF is a professional pop filter, suitable for all vocal applications. Because of the materials utilized, it is significantly more effective than fabric filters. Use of the SP-MPF will allow higher recording levels to be achieved, with less risk of the clipping associated with 'plosives' and large bursts of air. The SP-MPF directional capability allows for different sonic detail depending on which side of the filter faces the artist. The front side (logo facing the artist) offers better midrange clarity and less low frequency detail. Turn it around, you get less midrange and more lows! The included adjustable goose-neck and metal clamp allow for easy positioning and because the SP-MPF is metal, it can be sanitized between sessions. If you have any questions about this product by Studio Projects, contact us by completing and submitting the form below. If you are looking for a specif part number, please include it with your message.